Absolutely safe to run dry RM-TS, the first magnetically coupled centrifugal pump without any sleeve bearing in the world that is absolutely safe to run dry. Conventional magnetically coupled pumps are not designed for dry run situations. In fact, sleeve bearings used in such high-speed systems need continuous liquid-film lubrication to keep bearing friction and the resulting frictional heat as low as possible and also to provide the bearing with sufficient cooling. We present a totally new type of magnetically coupled centrifugal pump that works without any sleeve bearing. The coefficient of friction of the new type of bearing that has been used for the first time with magnetically coupled centrifugal pumps is so low, that only a minimum of heat is generated. Therefore, the bearing does not require any cooling or liquid lubrication. 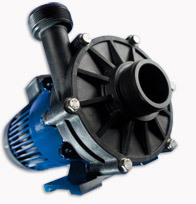 The new pump includes all advantages of our longstanding experience with pumps of the RM type and the additional certainty that they will not be damaged by dry running: All components of the pump head that are in contact with the fluid, are still metal-free, this is to assure optimum chemical resistance against aggressive fluids. Since the pump does not have a shaft seal, it is hermetically separated and because of this unique design, leakages through worn shaft sealings are definitely ruled out. We guarantee safe to run dry. Click here for Flux Renner Run Dry RM-TS.